Runners, it’s time for St. Pete Run Fest. Whether you’re a marathoner or a fetus, they’ve got a run for you. Am I signing up? Sadly no. I had surgery last year and race organizers said I couldn’t run with a personal ambulance trailing me. But you should. My last pair of running shoes lasted about 7 years. I finally had to get rid of them when the white soles turned yellow, cracked, and then fell off. God bless runners. I admire what they do, even if I just don’t understand it. I once wrote a 125,000 word book, got done, and promptly filed it away as a “good learning experience.” People say, “I could never do that.” Well, I cannot for the life of me understand what would possess someone to wake at 5 a.m. and run for 30 minutes. In my house, the only activity before the sun rises involves catching an airplane. No… believe me, I’ve tried. When I met my wife she was running almost daily, 3-4 miles – hair pulled back, cute running outfit, striding along the waterfront. When she asked me to join her, what was I going to do? Say no? I was with her step for step. I’ll admit, I relished the red lights where we could take a break, but I dug deep and kept up. I even entered a few 5Ks with her. I finished ahead of her – once. Of course, that was the time she filled out my race registration in her chicken-scratch and my time was posted under the name “Jonas Kviel.” While she was sometimes winning her age group, I was middle of the pack. Respectable. Until a race on St. Pete Beach where I willed myself across the finish line alongside a 78 year old man with a metal rod in his leg. My competition days were over. The more I ran, the harder it got, both physically and mentally. She married me and I hung up my running shoes. I really wish I could have gotten hooked because people who love running, really love running. One of my college roommates, who I barely saw walk to class, became a marathoner and triathlete. He goes to Disney and runs a “Goofy.” This involves running a half marathon on one day, and following it with the full marathon the next, and then putting your tongue on the center rail of the Monorail. St. Pete Run Fest offers its own version of a “Goofy.” It’s called the Dolphin Double: Just run the Three Daughters Half Marathon (did someone say “beer”?) and then chase it immediately with the Outback Steakhouse Sunshine City 5K. Then do the Three-Pete which is completing the half marathon for three consecutive years. 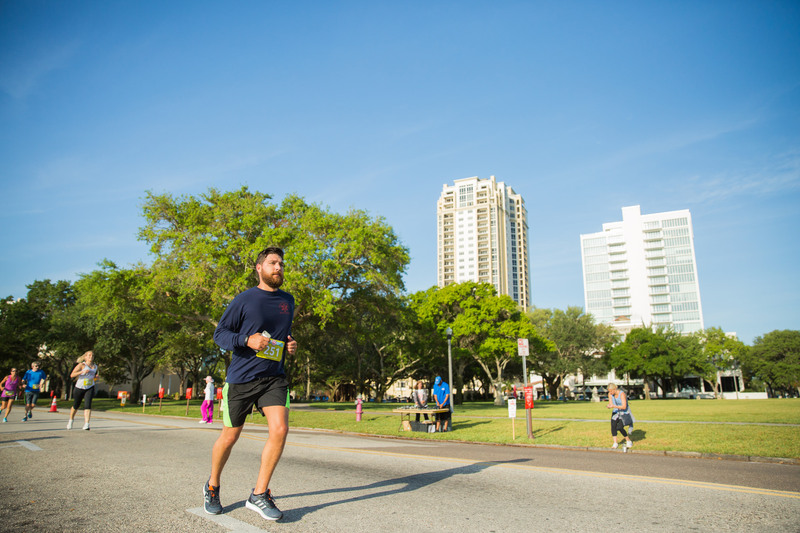 On top of it all, Run Fest has partnered with The St. Petersburg Free Clinic, Johns Hopkins All Children’s Hospital and Goodwill, so you’re not just running to inflict self-loathing on hung-over brunchers, but also to support some great non-profits. Nothing like finishing your 13.1 miles and sitting down for Eggs Benedict and a Bloody Mary with a medal around your neck. Heck, order an extra side of bacon. You’ve earned it. Check out https://stpeterunfest.org.